Bulldogs run away from Broncos. 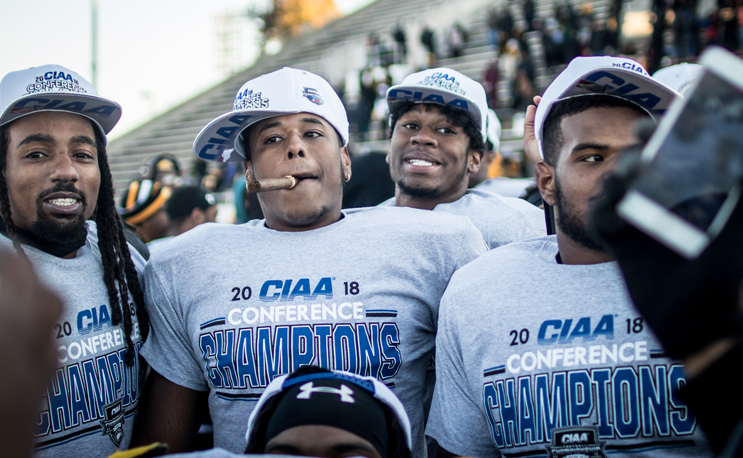 SALEM, VA–After a handful of disappointments Bowie State has finally won an outright CIAA Championship. The Bulldogs (9-2) plowed through Fayetteville State (6-3) on Saturday afternoon 30-10. Bowie quarterback Amir Hall was 15-26 with 180 yards passing and 138 yards rushing en route to his first CIAA title. Hall is known for his passing from the pocket but it was his two first-quarter rushing touchdowns that gave BSU an early lead. He scored on runs of 14 and six yards to put the Bulldogs up 14-0 heading into the second quarter. In maybe the most spectacular run of his career Hall broke out with an 80-yard run to give the Bulldogs a 21-3 lead heading into the break. In the third quarter, Bowie tacked on a field goal and a 13-yard touchdown pass to Daryl Jasper for a 30-3 margin. The lead was insurmountable at that point, a touchdown midway through the fourth by FSU finished the scoring for the day. The Broncos outrushed the Bulldogs in the game 208 yards to 196 but only managed 88 yards passing. The loss should end the Fayetteville State season. The Broncos were ranked 10th in last week’s NCAA Super Regional poll. Bowie State’s season will certainly continue into the postseason. The Bulldogs were ranked fourth in the Super Regional poll and winning the conference championship sealed the deal for them. The NCAA Division II playoff field will be announced on Sunday.